The picture at the top of the post is, in my humble opinion, the best CAPTCHA ever designed. A CAPTCHA is a series of characters drawn in a way that a computer program can't read. Usually in an unintelligible font or on a confusing background. You've seen many CAPTCHA images in your online life: in forums, online forms and even when commenting to this blog. The idea is the same: make sure that whoever fills up the form is a human and not a machine. Well, recently, people have been enraged that hackers managed to break the CAPTCHA on TicketMaster.com, thus allowing scalpers to get the bulk of the tickets to a Hannah Montana show (another Disney brainwash), before regular parents. This interesting article explains why the CAPTCHA hasn't really been broken - but that the TicketMaster developers have been negligent in their jobs. It also provides CAPTCHA samples and explains which you should use on your site - if you don't want to be visited by bots. 2.2 million people got married in the US last year. 1.4 got divorced. With these odds, it's a wonder why people get married in the first place (my guess: to provide income for lawyers ). However, if you like the odds, I suggest bookmarking the following site, just in case: Divorce360.com is a site for people who need support before, during and after their divorce process. Built by a startup from Florida, I'd give a lot to see the presentation they gave their VCs to get the seed money ("Chances are, more than half the people in this room have gone, or will go through a divorce..."). Have you heard of the BSA (Business Software Alliance), the agency in charge of keeping copyrights for the largest software manufacturers out there? (oh, who am I kidding - mostly Microsoft). Well, according to this article, their strategy of getting money, is targeting small companies, who can't afford to fight back. Another interesting fact: they are usually notified of software license violations by disgruntled, or fired IT employees. So managers - be nice to your IT people! I've been playing around with a beta of SP3 for Windows XP. It works nice, but nothing to write home about. But more and more sources and blogs around the net are reporting that it delivers up to 10% performance boost over SP2. Some of the measurements can be argued, but I'm still trying to understand: why would Microsoft continue to improve XP, when it clearly wants us all moving to Vista? Do they know something we don't? Will Vista fold like Windows ME? This funny post asks the question: "what if Gmail has been designed by Microsoft?". If you've ever suffered on the MSN Hotmail site, you'd appreciate this . This patent request, filed by Amazon, is quite scary and enraging. It patents "Generating Current Order Fulfillment Plans Based on Expected Future Orders" - or, in plain English - how to ship slower to customers who are not predicted to provide future business. I understand awarding frequent customers - but penalizing the infrequent? And finally, a new gadget in the ocean of gadgets introduced over the last 2 weekss caught my eye. No, it's not a new media player, or a nifty GPS. This one is more practical and much cheaper. If you're a plant lover, you know you're biggest dilemma is when to water your green friend. 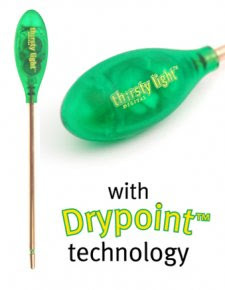 Enter ThirstyLight - a tiny humidity sensor with a green LED, that will glow when your plant needs water. For $10 a pop - this is a great idea. Get them here. b. I know some people who believe in true love.